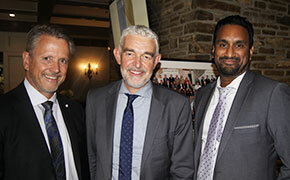 Michael Pepper, President & CEO of TICO from its formation in 1997 through 2014 with Scott Stewart, TICO Board member and President, G Stewart Travel Services Ltd.
TICO Board member and Travel Corporation Canada Controller Richard Edwards with Doreen Lynch, Director of Membership at ACTA. 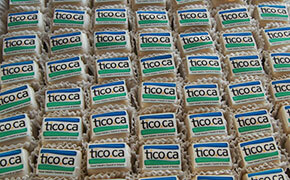 Tiny TICO cakes celebrate 20 years of Ontario’s Travel Regulator. TICO Executive Assistant Heather Wilkins (l) and Susan Janko, Administrative Assistant, organized the 20th anniversary reception. 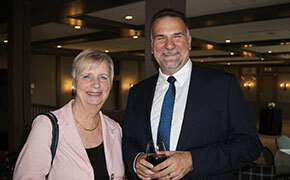 Two former TICO Board Chairs – Jill Wykes, Wykes Label Communications Consulting and Richard Vanderlubbe, President, TripCentral.ca. Oh, how time flies. While just about everything has changed in the travel industry since the Travel Industry Council of Ontario (TICO) – Ontario’s Travel Regulator – was created in 1997, it feels like yesterday. TICO staff, Ontario Ministry of Government and Consumer Services representatives and many current and former TICO Board members gathered at the beautiful Mississaugua Golf & Country Club on a scorching late September day to celebrate two decades of consumer protection for Ontario’s travellers. During those years, more than 25,000 travellers have received compensation from the Ontario Travel Industry Compensation Fund, for travel services they paid for and did not receive. 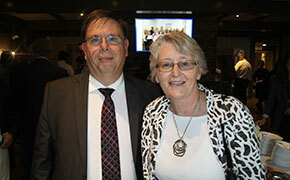 There were five past Chairs of the TICO Board in attendance – Jill Wykes, Richard Vanderlubbe, Scott Stewart, Arend Roos and Michael Janigan. And Smart paid tribute to another former Board Chair, Frank Dennis, unable to attend due to illness. Current TICO Board Chair Jean Hébert spoke during the event, praising TICO’s role in ensuring “strong consumer protection and a vibrant marketplace." 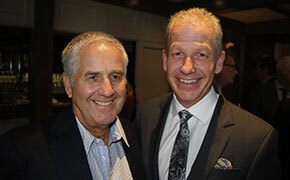 The event would not have been complete without the attendance of Michael Pepper who was named President & CEO upon TICO’s formation in 1997 and ran the organization through good times and bad through 2014. 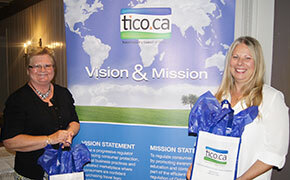 As well as providing consumer protection, TICO helps protect the reputation of the industry by policing the actions of tour operators and travel agents as mandated by Ontario’s Travel Industry Act. TICO recently helped win a conviction and jail term for former prominent retail industry member Ron Greenwood, whose illegal actions cost the Compensation Fund over $2 million. Smart told Open Jaw the Fund won’t likely see much of the money back – Greenwood is 70 and in jail – but the conviction and penalties serve as a powerful deterrent. TICO staff and Ontario registrants are eagerly awaiting the results of a government review of the Travel Industry Act, with the goal of keeping regulation up to date with a fast-changing business.